“I don’t have money in my budget for a new landfill somewhere. We need to extend the life of this landfill. That’s what we worked on for the last five years,” says Mayor Ryan. He discussed the issue with the News: How much would it cost to create another landfill and retire the current one, except for the transfer station, which could equally serve a tip at, say, Brewer Estate? NEWS: You are now thinking of buying new land, and you’ve got to look after the existing landfill in any case, whether the new part of the landfill is going to be in the present location of elsewhere. What would be the difference in cost? MAYOR: At this stage there is no discussion in council over shifting the landfill. NEWS: How were council plans for the extension of the landfill made public and how much more would it cost to have the new section of the dump in another location? MAYOR: That’s a piece of string, I can’t help with that one, I give you a clear message that the Alice Springs Town Council has no intention of shifting the landfill at this stage. We won’t be going off to do a sum, to identify the cost, if we have no intention of shifting it at this stage, because of the massive cost. Mayor Ryan later modified his statement to “we are investigating possibilities for expansion of the landfill”. There’s been no answer about how and when – if at all – the public has been informed about council plans for the expansion of the landfill in its present location. The moving of the tip, with just the transfer station now being built remaining operational, has been mooted many times, including in July last year. In 2000 the council commissioned Maunsell McIntyre to draw up a landfill management plan which has, in part 3.8 on page 19, a chapter on site rehabilitation: The final landform will be consistent with the slopes and forms found between Commonage Road and the Heavitree Range … once filling is complete, the site will be restored to reflect site conditions in its vicinity … active future use of the site is not envisaged … to ensure that adequate cover material is available when required on site, suitable material will be stockpiled as it becomes available … landscaping of capped areas will be conducted in accordance with a landscaping plan. 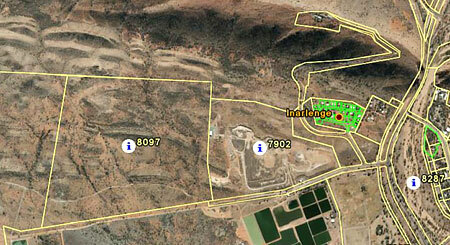 AERIAL PHOTO at top: Lot 7902 is the existing landfill. It it understood that the town council is negotiation for the lot to the west (left) of it, number 8097.